The Killing Ground is the first novel in the newly released second Ultramarines Omnibus, which also includes several additional short stories and even a nice graphic short. The story see's the Two Ultramarines Pasanius Lysane and Uriel Ventris escaping from the Eye of Terror after the events of Dead Sky, Black Sun. Nothing returns from beyond the Warp unchanged though and they will have a difficult task ahead if they want to be welcomed back by their brothers in arms. Having fought alongside renegade Marines and mutant cannibals will take some explaining, even if it was all done for the right reasons. Hijacking one of the Iron Men's vile, demonic machines they escaped to the world of Salinas along with a few of the Unfleshed (the mutant cannibals mentioned above). The planet of Salinas is home to an Imperial Guard army who have been awarded the world for years of loyal service to the Empire however the indigenous populous hasn't taken kindly to this "invasion". Since quelling an uprising when first arriving on the world which lead to a massacre and destruction of the city Khaturian (now known as "The Killing Zone") a rebel group known as "Sons of Salinas" continue to fight against the new government. To complicate matters further, when Pasanius and Uriel came through the gates of the Empyrean, a lot of energy came through too and the walls between the warp and the world have worn paper-thin in places. When you add in the ungodly power created by the massacre of thousands and the souls that still haunt the ruins then Pasanius and Uriel may have more trouble on their hands than even their gene-enhanced power can deal with. 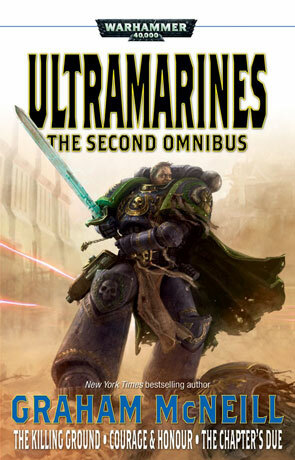 I've not read the first three Ultramarines books in the series however it didn't prevent me enjoying this book in the slightest. McNeill's deft prose and rich characterisation combine with a great plot and effective Warhammer 40k backdrop to produce something that is immediately engaging and entertaining. The author has also managed to get the atmosphere spot on with a well balanced mix of technology, horror and frantic battles that feels right at home in the Warhammer 40k universe. McNeill manages to do real justice to the Ultramarines here, his depiction of Pasanius and Uriel is great, managing to create a real sense of comrades in arms and yet still instilling the feeling of the super soldier post-human. For me The Killing Ground also managed to highlight the other side to the Warhammer 40k universe, that ethereal plane that is an integral part of the universe and yet is easily forgotten when not reading about psykers and astropaths. The plot itself is great and makes a very effective return to the real world for the two marines, a trial by fire and one that has a pretty rewarding ending, setting the scene quite effectively for the next novel in the series. Anyone with the slightest interest in Warhammer 40k should read The Killing Ground, you don't need to be a fan of the Ultramarines or even the Space Marines as the intriguing plot, descriptive action and dramatic flair creates a great story all it's own. Written on 22nd June 2012 by Ant.